If your iPhone has been stolen and you didn't install the Find My iPhone app on it, don't panic. You don't actually need to the Find My iPhone app at all. Find My iPhone is a huge asset for people who have lost their iPhones or have had them stolen. The free service provided by Apple uses the iPhone's built-in GPS to track the location of your phone. Even better, it lets you do things like locking the phone over the internet so the person who has it can't use it or remotely deleting all the data on the phone. Think you need the Find My iPhone app to use all of those great features? Think again. This article is only covers the difference between the Find My iPhone service and the Find My iPhone app. If you're having problems using Find My iPhone, this article isn't what you need. Instead, check out Why Is Find My iPhone Not Working? If your phone was stolen and you didn't have the Find My iPhone app installed, I've got good news: It doesn't matter! Whether or not you had installed the Find My iPhone app (download at the App Store for free) won't stop you from tracking your phone. The Find My iPhone app isn't required for tracking your iPhone. To understand why this is the case, you need to understand that the Find My iPhone service and app are different things. The Find My iPhone service is based in the cloud. That means the service lives on the internet, not on your phone or in app, and can be used over the internet. This is an important point. The app is not what makes Find My iPhone work. In fact, because it's a cloud-based service, you don't need an app at all. You can use Find My iPhone in virtually any modern web browser. Just go to iCloud.com and log in using the Apple ID you used to set up your iPhone (which is probably the same as you use for iCloud. If not, use the Apple ID you use with iCloud). Once you're logged in, click the Find My iPhone icon and you'll be using the tool. Lost your iPhone and looking for tips on how to use Find My iPhone to track it down? Check out How to Use Find My iPhone to Locate a Lost or Stolen Phone. What Is the Find My iPhone App For? If the Find My iPhone app isn't required to use the service, then what is the app for? 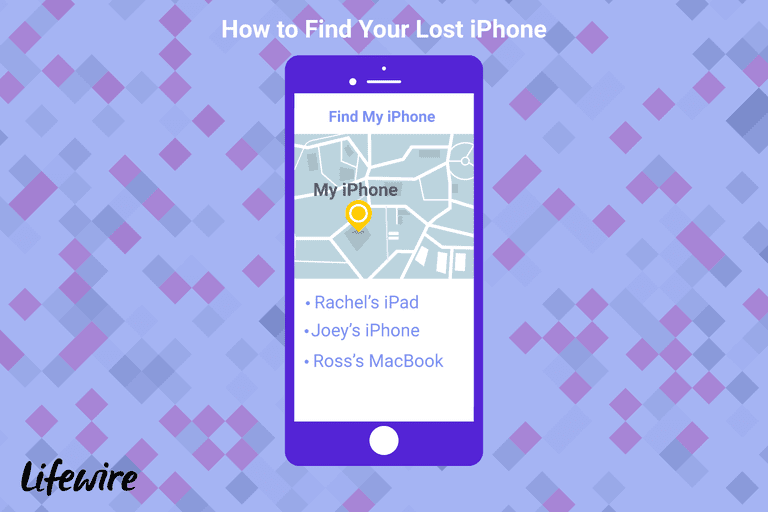 The app is actually just another way to track your lost or stolen iPhone. Using the Find My iPhone app is basically the same thing as logging into iCloud to use the service as described in the last section. The idea isn't that you install the app on your phone to find your phone when it's lost. Instead, you install the app on someone else's phone to use while you're trying to find your missing phone. You can use the Find My iPhone service on a computer to track a lost phone. But if you're trying to hunt down your device while you're on the move, doing it from a friend or family member's phone using the app is easier than lugging a laptop around the house or in a car. Now you know that you don't need the app to use Find My iPhone, but there's one other major requirement: You need to have turned on Find My iPhone before your phone was stolen. ﻿This isn't something that can be turned on after you lose the phone, whether you've got the app or not. Find My iPhone has to be enabled on your phone before it's lost if you want to find the phone. Here's some good news: In iOS 9 and up, Find My iPhone is automatically turned on during the iPhone set-up process if you enable iCloud. So, if you have had iCloud running, it's a pretty good bet that you're running Find My iPhone, too. If not, you should make sure to enable Find My iPhone right away. If your iPhone has been stolen, the first thing to do is prevent a thief from obtaining your personal data. If you got to this article out of curiosity, make sure Find My iPhone is enabled on your device. Better safe than sorry, right? Did you know that there's a version of Find My iPhone specifically designed for Apple's AirPods earbuds? Use it to find lost AirPods by reading How to Find Lost Apple AirPods.